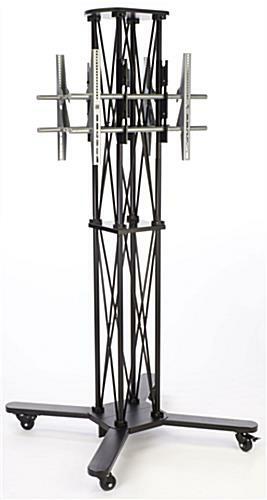 These TV Stands Feature a Strong Truss-Style Design Built to Hold up to 160 lbs! 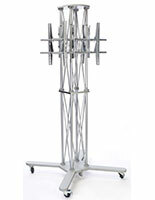 Commercial TV Stand Company Maintains a Large Warehouse to Ensure Fast Shipping! This cheap TV stand that measures 83-1/2" tall comes equipped with locking casters for straightforward portability. 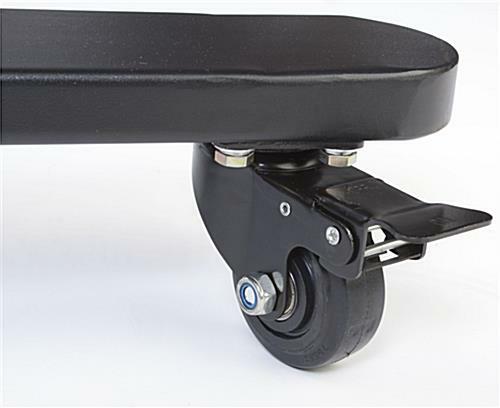 This design gives users the ability to relocate the fixture with ease, while maintaining a stable structure once the wheels are locked. 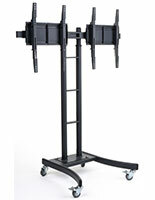 The mobile plasma TV stand is designed to hold monitors over 50" in size, each weighing up to 80 lbs. 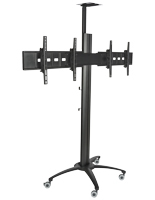 The versatile VESA brackets showcase a television either vertically or horizontally. This TV stand mount that holds two flat panel monitors back to back, is compatible with most VESA standards, fitting brand names like Sony® and NEC®. Please note that the floor-standing display is not compatible with 200mm wide units because of the placement of the mounting brackets. 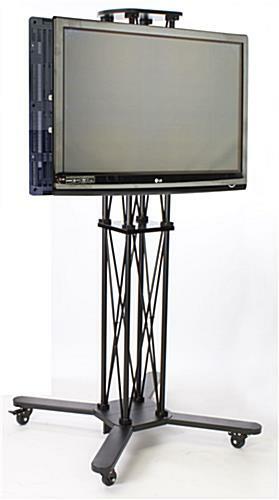 This LCD TV stand for professional use is typically found within a trade show presentation or as a welcoming fixture in the foyer of a building. The black aluminum truss structure blends in with any décor or atmosphere, while its simple setup and portable design make it great for temporary exhibits! 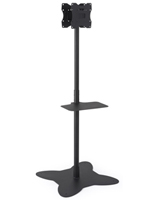 This TV stand mount features two mounting brackets for developing a double-sided presentation. 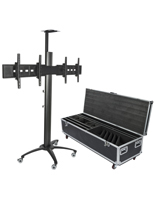 The freestanding LCD television rack minimizes the area needed to have a dynamic promotional display that captures the attention of passersby from any direction. 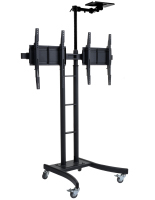 This black TV stand mount, also known as a flat screen monitor holder, has a truss-like structure for a stylish yet portable setup. The entire fixture breaks down into a few separate components, all of which are stored within the compact carrying cases. 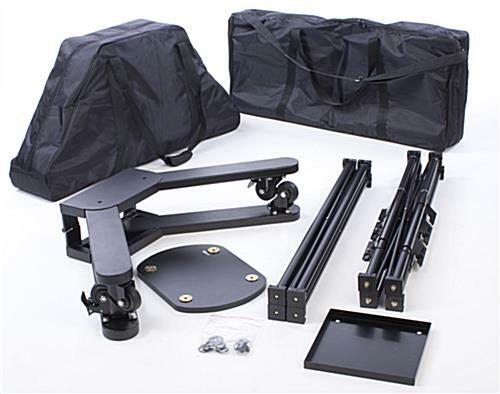 The portable TV stand mount assembles in minutes by simply screwing each truss section together. There is no other hardware required to set up the fixture.